It is officially hurricane season and Florida's rainy season. So, what does that mean --- that often means rain and more rain with the worst drivers in the country on the roadways in hazardous conditions. Flooding can occur slowly over many days or happen very quickly with little to no warning. It's important that drivers do not underestimate the force and power of water. Many preventable drowning deaths occur in automobiles as they are swept downstream or stalled in water. Here are a couple of important notes regarding driving in and around water and how to be safe. Many Floridians do this regularly in rain storms, but did you know it is illegal and could cost you more than a $120 fine? Hazards lights are only to be used by drivers as a signal of a hazard - for instance - when you have to pullover onto the side of the road or your vehicle is disabled. It is for stopped drivers and funeral processions only. Many drivers use hazards thinking it helps them see better or for you see them better, so you do not rear-end them; however, the use of hazard lights actually worsen one's danger while driving in a downpour. Other drivers are often confused as to the potential hazard. The other driver may actually think you are stopped in the middle of the roadway. They may have a difficult time distinguishing your hazard because it may appear to them that you are brake tapping or using a turn signal. Even worse, emergency personnel will have a difficult time recognizing the individuals who truly need their assistance. Do not use your hazards in a downpour unless you are truly in a state of emergency or are pulled off the road. If visibility is so bad that you cannot see, then pull off the roadway, preferably into a parking lot to wait out the rain or for conditions to improve. The only lights that should be on when driving in the rain are your headlights! Living in Florida, we are all aware of the flash flooding and standing water as a result of a steady downpour or extended periods of rain. Vast amounts of rain block drains, flood streets, and pools water on sides of the roadways; but did you know that flash floods are the number one weather killer in the U.S. The Centers for Disease Control and Prevention report that over half of all flood-related drownings occur when a vehicle is driven into hazardous flood water. Don't blindly follow other drivers. Don't assume the water is shallow. Don't assume you can make it through. The water may be a lot deeper than you know and you have no idea if the road below has worn away or what is under the water that could hurt you. Even experienced drivers can be caught in a flood. Please note that cars can float in one foot of water and can be carried away in two feet of rushing water. You are strongly advised to avoid any flood or standing water areas. Turn around and try and find a safer, alternative route. Pay attention to barricades. 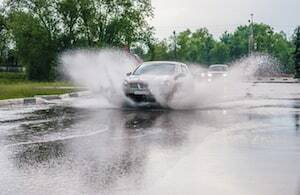 If you have no alternative but to drive through the water, try to avoid anything more than six inches of standing water or four inches of moving water. Watch for downed powerlines and avoid that area. Watch for items traveling down streams so you do not get trapped or hit. Keep your vehicle on the crown of the road if possible, and slowly and steadily crawl though the water. This will help you maintain control of the car, avoid hydroplaning, avoid getting water in the engine, and also to help avoid making a bow wave. As soon as you are safely through test your brakes to make sure they are functioning properly. If you do get stuck or trapped in rising water and cannot start your vehicle, abandon the car and find higher ground if it is safe to do so. If you are unable to use the door, try your windows or sunroof to exit the vehicle. If you are still unable to get out safely, use your cell phone to call 911 immediately for assistance.